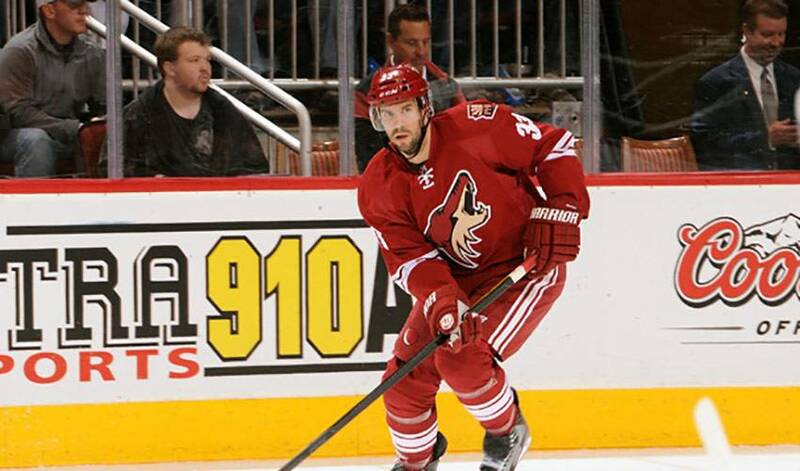 Veteran defenceman Adrian Aucoin got good measure of just how much the playoffs had taken flight for the Phoenix Coyotes when the team landed after their opening-round series victory. As expected, there was much pandemonium in the Phoenix dressing room after their 4-0 series-clinching triumph in Game Six over the Chicago Blackhawks in their Western Conference quarter-final matchup. For Aucoin, who has skated in 60 NHL playoff games, it was a familiar feeling in not wanting the excitement and emotion to end. Now, for the first time in franchise history, the Coyotes find themselves in the Western Conference final after defeating the Nashville Predators in five games, punctuated by a 2-1 series-clinching win on home ice. Aucoin, who has one assist in nine post-season games in 2011-12, had 12 shifts in Game Five, as Derek Morris and Marin Hanzal scored for the Coyotes to put them one step away from playing for the championship. They'll now face the Los Angeles Kings, the West's No. 8 seed, who bested the No. 1 Vancouver Canucks in the quarter-finals and the No. 2 St. Louis Blues in the second round. At 38, Aucoin, who was taken 117th overall by the Canucks in the 1992 NHL Entry Draft, has dealt with his share of tough playoffs experience. He went through a stretch of six seasons where he wasn't part of a playoff-bound club. He's made the playoffs the past five campaigns, but up until this year, had never been past the first round. So, it's certainly understandable that the well-respected and well-traveled (he's played for Vancouver, Tampa Bay, New York Islanders, Chicago, Calgary and Phoenix) blueliner is enjoying the Coyotes' current run. For Aucoin, who was the recipient of the Babe Pratt Trophy (Vancouver Canucks' best defenceman) in 1999, it's a pack mentality that's put the Coyotes where they are. Aucoin's has also had the chance to pair up with several fellow defencemen throughout the campaign, regular season and playoffs. “I've been partnered with Oliver Ekman-Larsson for a time, Keith Yandle and Rusty (Rostislav) Klesla, too,” noted Aucoin. “I'm being counted on for a little bit of everything. Aucoin has experienced big moments in the past, including a gold medal with Team Canada at the 1993 World Championships in Sweden, along with a silver medal at the 1994 Winter Olympics in Norway. You don't need to ask what he'd like to add to his collection. And that's just what Adrian Aucoin and the Coyotes are working towards, a determined group in search of that coveted opportunity.